In the Magento default functionality, if buyers want to purchase multiple products, they need to visit each product listing page and then add products to the cart and select the quantity of the particular product. 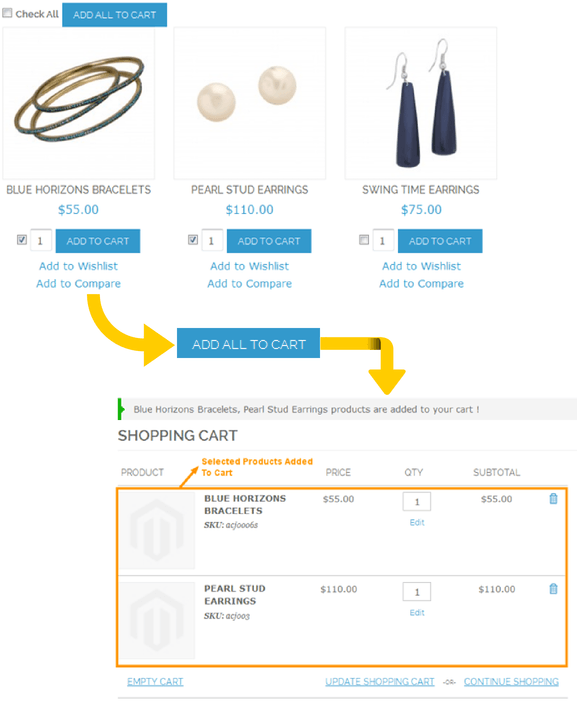 Every time a buyer wants to add a product to cart, this process must be repeated. Add Multiple Products to Cart makes things easier for online buyers by allowing them to select all items they want to buy and add them to the cart with a single click of the “Add all to cart” button. Shoppers are also facilitated with an additional feature that allows for selecting the quantity right from the product catalog page. Add multiple product to cart magento extension is ideal tool to simplify the purchase process and boost sales for wholesale and B2B business. The “ Add Multiple Products to Cart magento extension is designed by the experts to simplify the shopping experience of online buyers and allow them to add multiple products to cart with a single click. This easy-to-install extension gives many other options for setting from Admin panel. In addition, customers have option to “Add All to Cart” and all the listed products will be added to the cart with selected quantity. 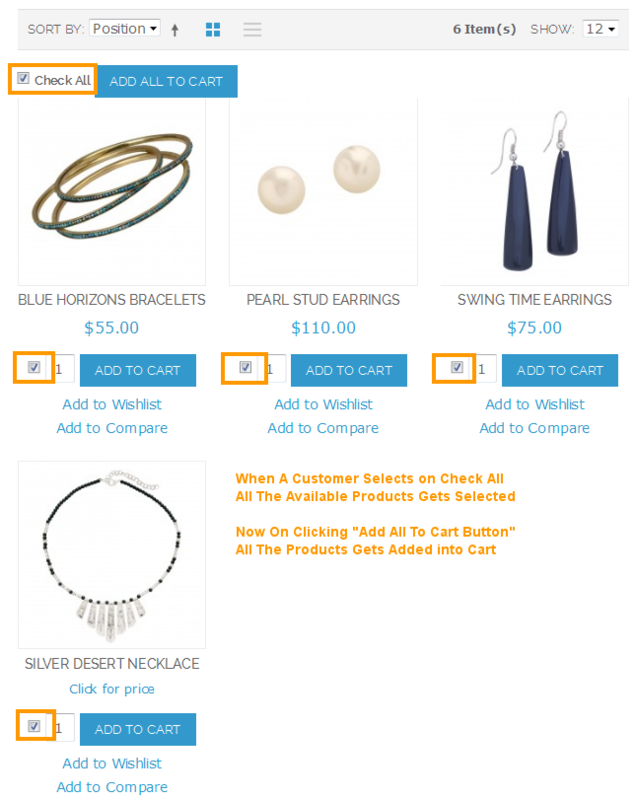 Each item listed on the product catalog page is available with a check box and quantity box next to it. Online buyers can simply check on the box and select desired quantity to selected product. Multiple products can be selected from the category page. If shoppers want to reduce the pain of adding products to cart one by one, then “Select All to Cart” button is available that can be used to add all the listed products to cart at once. This eliminates the stress involved with the buying process. There are times when buyers want to add products to cart with different quantities, especially when you are buying in bulk. This extension allows them to select the quantity of any product available in the product listing page. Add Multiple Products to Cart Extension offers an additional benefit to online retailers that is visually appealing layout to engage more customers. Note: The extension work only with simple products.